How Quickly To Wash the Floor in the Whole House? Quickly to wash the floor in the whole house is not so easy as it seems to many housewives. In this case, as in any household cleaning, there are a lot of nuances, knowledge of which greatly facilitates hard work. After all, the modern interior design offers a variety of floor coverings, and each of them has its own approach in professional cleaning. Let’s borrow a couple of secrets and find out how easy and quick to wash the floor in the whole house. This and other information you will find in our material. Wash the floor is the final stage of the general cleaning of any dwelling. After the things are laid out in places, the lockers are wiped, and the surfaces are freed from the dust layer, it is time to clean the floor covering from sand, dirt, and stains. If you follow the simple rules at this stage, then it will be possible to spend this part of the cleaning much quicker and with less effort. After all, you will agree, at the end of harvesting activities of energy there is not much, but meanwhile floors are one of the dirtiest surfaces in the house, and it is necessary to clean them as much as possible from pollution. Many of these rules seem obvious and too simple, but they allow you to quickly and effectively cope with washing. If you ignore them, then the process inevitably drags out, absorbing the forces and time. But this is what we do not want. Therefore, we follow simple advice and greatly simplify our lives! – Before proceeding to wash the floor, it is necessary to remove all things from it, and take small objects, for example, chairs or stools, out of the room or put them on the tables with the legs up. Needless to say, that from carpets it is necessary to shake out dust beforehand. Otherwise, all the impurities from the carpet will quickly move to the clean floor and securely adhere to it, greatly complicating the subsequent cleaning. – Do not immediately start a wet cleaning – it is best to vacuum the floor first, or sweep the broom and brush with sand and dry dirt. If this is not done, they will be smeared with a wet rag on the floor covering – it will be more difficult to wash the floor, in addition, there will be stains. If you use a broom, it should be slightly moistened so that the dust does not rise into the air and again does not settle on the already swept coating. – Wash the floor with a damp cloth and start at opposite corners. Be sure to pay attention to plinths – they accumulate a lot of dirt and dust. Try not to step on already washed up areas, gradually moving towards the exit. Otherwise, the coating will leave your footprints that will be visible after the floor has dried. – In order not to leave a divorce and the floor shone, it is best to wash the floor it with water with a small amount of a special detergent composition for floor coverings diluted in it. In this case, it is easier to wash the dirt and does not have to wipe the floor several times. In addition, after such cleaning, the coating will shine. Another plus: next time cleaning will be much easier, and pollution from the floor will be cleaned easier. – Change the contaminated water more frequently so that dirt and harmful bacteria are not transferred from one room to another. 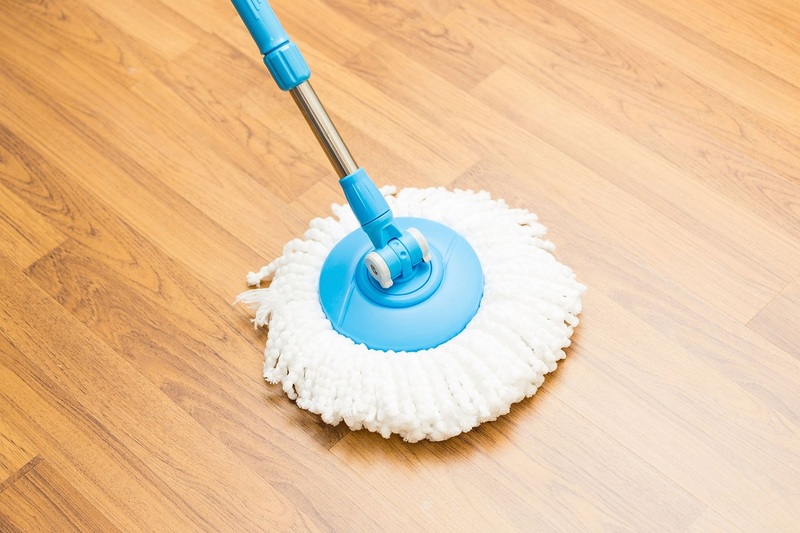 Depending on the type of flooring, there are also different ways to efficiently clean it. After all, today in homes can be found as parquet, painted wood floor or cork, and laminate and linoleum. Each such material has its own characteristics and also reacts differently to excess water. Smearing the dirt with a wet rag, you can easily ruin the floor. Therefore, we understand the types of flooring and how to clean them. Wooden floors are usually covered with paint or varnish. Due to this natural material does not absorb water, which means that you can wash the floor with a damp cloth. – For daily cleaning, it is enough to simply wipe the cover. If the floor is washed once a week, some detergent should be diluted in the water in order to clean the accumulated dirt. You can use a liquid soap and wash the floor with a soap solution. After this, you will have to wipe the surface a couple of times with a cloth moistened with clean water to remove the residue of soap. – If you use detergent for parquet, then the floor will not need to be wiped again after such treatment. This product is not only for parquet but also for wooden floors. Very little money should be diluted in water for the preparation of a washing solution. It is enough to wash the cover, moistened with a cloth in it, to get rid of dirt and give the floor a shine. – The folk way of giving shine to wooden painted floors is the use of a solution of water and vinegar for washing. By the way, the paint thanks to such cleaning will last on the coating much longer. Unambiguous minus – the smell of vinegar, which will be felt for some time indoors? Therefore, for daily cleaning, this method is not very suitable. Popular at all times the parquet floor is utterly whimsical in cleaning. A wet rag with dripping drops of water for him is fatal. Like scratches from heels or claws of animals – the varnish is covered with a web of scratches and the floor ceases to shine. That’s why for the washing of parquet is best suited special means. – Before proceeding to the wet cleaning, the parquet should be well vacuumed. Thus, all rubbish and sand, capable of scratching the varnish, will be removed from it. By the way, a washing vacuum cleaner and a steam cleaner for cleaning such a floor will not categorically suit. Hot steam will cause a rapid swelling of the floor covering. – The main rule: the parquet is not friends with water. Therefore, for daily cleaning of the floor, only a slightly damp cloth, which has been wrung out in the most careful way, will do. – A thorough washing of parquet with a wet cloth using a soap solution can be carried out no more than a couple of times a year. In this case, immediately after washing the dirt and stains, the coating should be wiped dry and treated with a special protective agent. To make the parquet glisten, a little glycerin is added to the water for washing it. – Spots and dirt tracks should be removed from the parquet as quickly as possible, otherwise, they will absorb into the structure of the floor and they will not be able to clean them. Coverage will be hopelessly spoiled. – Professional cleaning of parquet involves the use of a special composition. Detergent for parquet is perfect for daily use. It will not only remove all the dust and dirt from such a floor, but it will also help to deal with stains. But it protects the floor covering from strong dirt, scratches and tarnish special polish for parquet. In addition, it will give the floor a delightful sheen. Before applying the compound to the coating, it should be further cleaned with a means for removing the polish from the parquet H G. The product will remove layers of the old polishing compound, as well as all stale dirt and stains. By the way, this tool can be tried to deal with old spots. Only after such a careful treatment on the surface of the floor is applied a fresh polish. In this case, even such a whimsical coating, as parquet, will be reliably protected from any adversity. Due to the moderate cost and at the same time good decorative properties, laminate flooring is increasingly being chosen for flooring in any dwellings. The multilayeredness of this material ensures its strength and durability. The top layer, in whose role the coating with acrylic or melamine resin often appears, protects the laminate from damage. However, this floor, of course, cannot be called absolutely invulnerable. Laminate is afraid of scratches and excess water. – For such a floor, timely cleaning of sand and dirt is a vital necessity. First of all, the dry garbage is always cleaned from the cover, and only then can you start the wet cleaning. The grains are left on the laminate web of small scratches and deprive it of shine. – Do wet cleaning every day; if you have laminate flooring, it is undesirable. It will be enough a couple of times a week. On other days for cleaning the dirt, use a broom, brush or vacuum cleaner. By the way, a washing vacuum cleaner is often not worth using. After cleaning the floor with it, immediately wipe the cover with a dry absorbent cloth to remove excess moisture. – For wet cleaning of laminate, a microfiber cloth or a mop with a soft cloth attachment is perfect. The main thing is to prevent the accumulation of excess moisture and the appearance of puddles on such a floor. Water will swell the laminate. – People’s Council: to prevent the laminate from leaving a divorce, add a little vinegar to the water for washing it. – Specialists in the field of cleaning apply for professional washing of laminate professional tools that do not allow excessive wetting of the floor, carefully clean it and create a protective layer on the surface. Such formulations include a means for washing and brightening the laminate. It easily cleans even complex contaminants, prevents fading of the floor and returns to it a beautiful shine. The product is very easy to apply – it is enough to dilute a small amount of it in water and wash the laminate with a well-pressed napkin. After such treatment, the floor does not need to be cleaned again with clean water, which saves considerable time for cleaning. The agent leaves a protective layer on the surface, which will contribute to less contamination, and also extend the life of such a floor. This kind of flooring attracts with its practicality. In addition, linoleum looks good and glitters pleasantly, especially if it has just been laid. Moreover, now a huge variety of such material is on sale. However, in order to continue to please the linoleum with a beautiful appearance, it is necessary to properly care for and protect such a floor covering from the effects of high temperatures, mechanical damages, abrasives, and chemicals. They can cause him irreparable harm. – Immediately after laying linoleum should be left alone for a few days and to clean it, use only a vacuum cleaner or a broom, in other words, dry cleaning. – Remember: before you wash linoleum, it must be swept or vacuumed. Such a floor, like almost any coating, is afraid of the impact of abrasives. In this role, just the same will be sand and small stones, if you do not remove them from the floor before washing. Otherwise very soon your linoleum will lose its attractive shine, as it will cover with a web of small scratches. In addition, the uncleared dry mud will spread on the surface and you will have to fight with the divorce. – After a couple of days after laying, you can begin to wet the cleaning of such a coating – a rag soaked in plain water, or in a solution of liquid soap or powder, if the linoleum is heavily soiled. However, consider that after this you will have to wipe the floor several times with clean water to wash the floor away soapy stains. – To linoleum long pleased with the brilliance and brilliance of colors, and also did not dry up, experts in the field of cleaning for washing use professional detergents. Their advantages are obvious: do not flush with clean water from the floor, leave no stains, easily remove all dirt and, most importantly, protect the floor covering from external influences. These products include a cleaning and polishing agent for linoleum and vinyl coatings. It can easily cope with even the grime, improves the decorative properties of the coating and serves as a reliable protection against the rays of the bright sun, abrasive action and other factors, provided it is regularly used. You just need to wash the linoleum with a diluted in water remedy, wait until the coating dries, and then lightly polish it to achieve a pleasant shine. Eco-friendliness, as well as softness and warmth, distinguish the cork from other materials for flooring. The disadvantages of this coating include the complexity of installation, a fairly high cost, as well as short-lived. To cork floor has served for a long time, you need to know how to care for it, and strictly fulfill all the requirements. – This coating can be cleaned with a vacuum cleaner, a soft brush, and a well-wrung-out wet cloth. The cork is afraid of excess water, and accidentally spilled liquid should be wiped immediately. – The plug can be washed with a solution of soap or powder. The main thing is not to rub the floor with abrasives and do not use aggressive substances for cleaning. – Delicately clear stale dirt, renew the surface and protect it from micro damaging will help all the same cleaning and polishing agent for linoleum and vinyl coatings. It is enough to dilute a little of the composition in water and rinse them with the floor to significantly improve its appearance. An invisible protective layer, which will remain on the coating, will help significantly prolong its service life. To maximize the protection of the cork floor, experts advise to regularly apply for washing. Keep Reading: How To Create A Garden On The Terrace? Carrying out the rules of wash the floor coverings, you can cope with this difficult work quickly and easily. In addition, your faithful actions will help protect the material from which your floor is made and extend its life!